On Veteran’s Day this year, I searched through my archive for United States Flag images. Before I started looking through several thousand photos (well, close to 20,000), I assumed that I would find more pictures. I was wrong. Fortunately, I found a few surprises, even if some of the flags are barely visible. (And I have been finding more surprised after I originally posted this gallery.) 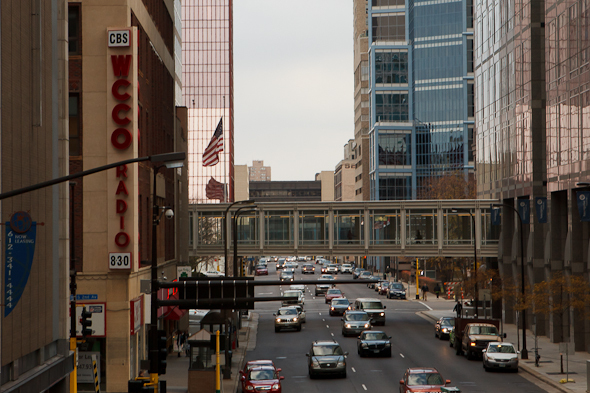 The photo above was taken on November, 16, 2011 in Minneapolis from a SkyWay. There are many guidelines about the proper treatment of the United States Flag. Many Americans violate the code unknowingly. Politicians, in the effort to appear patriotic, are some of the biggest offenders. I do not wear flag lapel pins nor do I burn American Flags, but I appreciate the freedom to do so. At the risk of appearing old fashioned or conservative, I wish more Americans would follow the proper guidelines for the flag. I wonder if there is a code for photographing the flag. This entry was posted on Sunday, November 13th, 2011 at 12:20 am. It is filed under Education and Technology and tagged with United States Flag. You can follow any responses to this entry through the RSS 2.0 feed.